Hope you had a good weekend. Here's tonight topic: how do you straighten your Neon Rays? Do you use it right off the card, not addressing the kinks? Over the years, I have tried many different ways to straighten it. I've used those "grippers and pullers" and I've even used "spit." (Yes... I have.) Other times, I would just use it straight off the card... kinks be damned. I plugged in my flat iron and turned the setting to a medium heat. I pulled the Neon Rays through the closed flat iron paddles, and BAM!... Silky Smooth and Straight. I shared this technique with my Saturday class students when Michelle brought in her daughter's flat iron. Everyone was impressed. The main thing to say is that once straightened, the Neon Rays behaves much better. Less twisting. Usually, I straighten about 4-5 lengths and any unused pieces go into that Neon Ray's Floss Away bag. Taxes are done, filed, organized, put away. Finito! All that's left is the paying. Yikes. It seems like the brief burst of house keeping is now segueing into my needlepoint work area. Otherwise, I might be a candidate for "The Most Messiest House" TV show. As you know, I am working on the Creepy Characters from NeedleDeeva... a new upcoming Halloween series/club for 2011-2012. There are 9 of them and each time I begin a new character, I search through previous threads which might be used again. Now that I am finished with Frankenstein, it's time to tidy up before I begin the next character. I sent The Pumpkin, The Devil, Frankenstein and Fraidy Cat to join NeedleDeeva & Vicky De Angelis in Dallas for the Destination Dallas Market in April. They were excited for the road trip. None were too scared about being boxed up... because 3 out of 4 of them have "Glow in the Dark" Teeth. You should really try the DMC Floss E940. It's good stuff. Speaking of good stuff... be sure to look at today's Plays with Needles blog. It is really cute and creative. Robin's getting ready for her appointment with her CPA. I'll be glad when April 15th is over. When she's doing her taxes, she doesn't have much time for me. 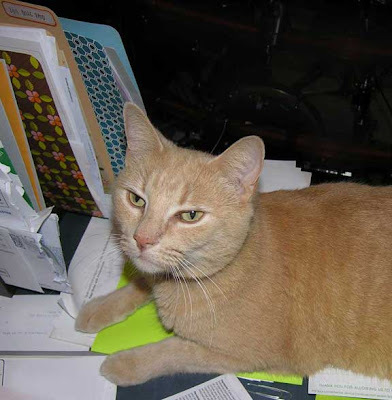 My solution is to curl up on her paperwork. First I took home one of Kelly Clark's Halloween Apples. Now I have taken home one of her bats. Enough already! I will be returning to the Dev L. Man, and the rest of the Halloweenie's characters, as soon as I finish this bat. 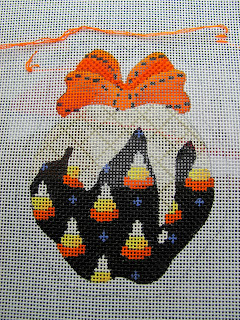 Amy has done stitch guides for three of the bats. More on that to come. Sorry I have been away so long. I have been working on a website for my husband. We are not publishing it for a few months. But we wanted it to be ready when some events happen that we can talk about. I will share the website with you as soon as we publish it. You will see what a wonderful and smart man he is. 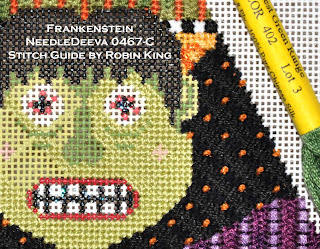 I'm working on Frankenstein (NeedleDeeva 0467-C) this evening. Stitching his face. 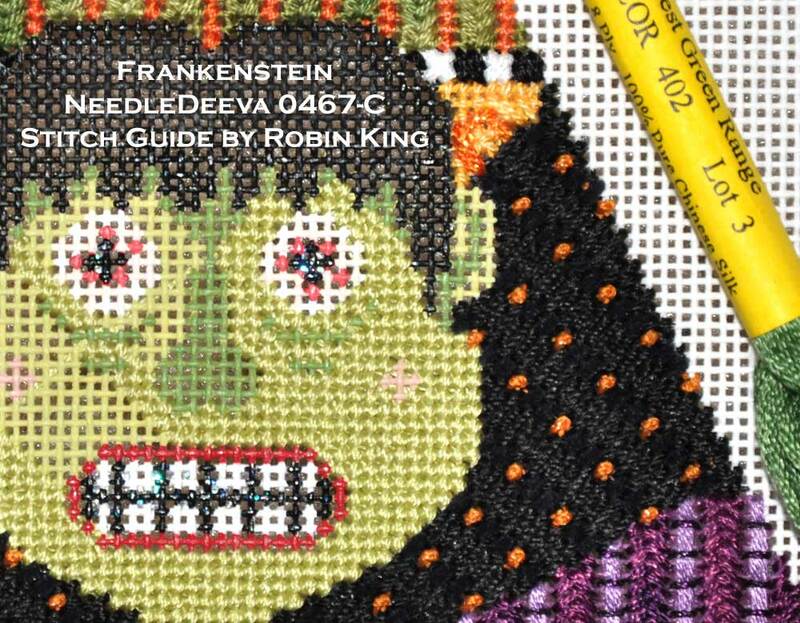 Using Needlepoint Inc. Silk 651 and 402. They are absolutely wonderful threads. 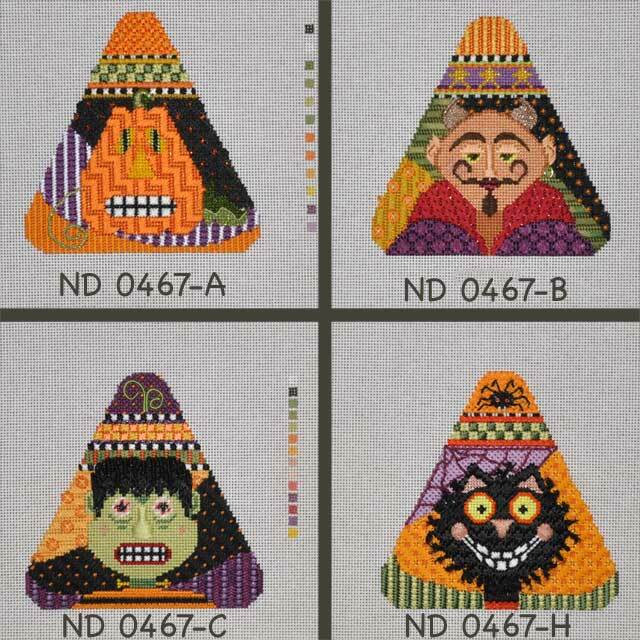 Here's their color chart so you can see the colors: Needlepoint Inc Silk color chart. Tonight was an interesting evening. I attended the March tweetup of the Memphis chapter of the Social Media Club. It was Pat's idea that we go... to see what's the latest in Social Media and how it might be able to improve our businesses. You remember Pat... my guy... is owner of Business Visuals, a photography company since 1982. Things have changed since his film days. He's gone digital and is a photoshop whiz. He has a website www.businessvisuals.net and he has a blog, Business Visuals Updates, too. He joined Facebook and also has the Business Visuals • Memphis Photographer Facebook page. Please Like Us and Follow Us, if you will. We went into the meeting, eager to learn. And, learn we did. The meeting was the brainchild of Howell Marketing; a smart savvy group of women in Memphis, lead by Amy Howell. Here's what we learned: tomorrow we will begin creating his Twitter account. There appears to be a harmonious mix of social media when you Blog, Facebook, Twitter and website all at the same time. Talk about spinning plates! What's my reference of "Spinning Plates?" The scene is from the Ed Sullivan Show. The entertainer comes on stage with long bamboo poles and a stack of white dinner plates. The music is peppy... the man gets the 1st, the 2nd, the 3rd, the 4th plate spinning on top of the bamboo poles. Just when he starts to work the 5th plate, the audience gasps because the spin of the 1st and 2nd and 3rd plates are slowing down... ready to crash. So the man runs back to them, spins them up... all is right... until the next group of plates starts to slow down. Back and forth he runs. Now that was entertainment! Often I feel like I am spinning plates. How about you? So, I'm use my new Social Media knowledge to get the first words out about these new Creepy Characters by NeedleDeeva. You can also follow me on Facebook (Robin King) and on Twitter (@catmom6). 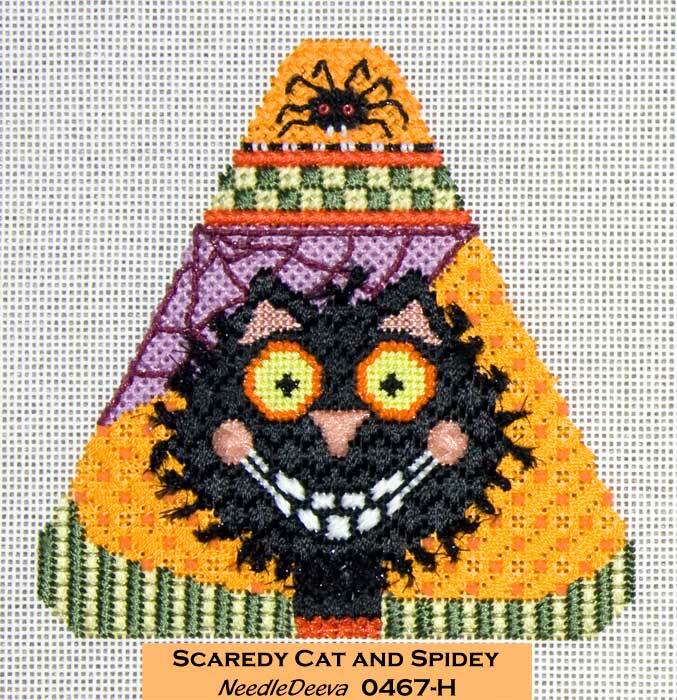 There is also a Needlepoint Group in Facebook, too. Who would have thought? It was Jane/Chilly Hollow who started the group. We've got stitchers, designers, artists and shop owners there. Come join us. Hello. I'll be back working on the Dev L. Mann soon. All is well. Just sidetracked.